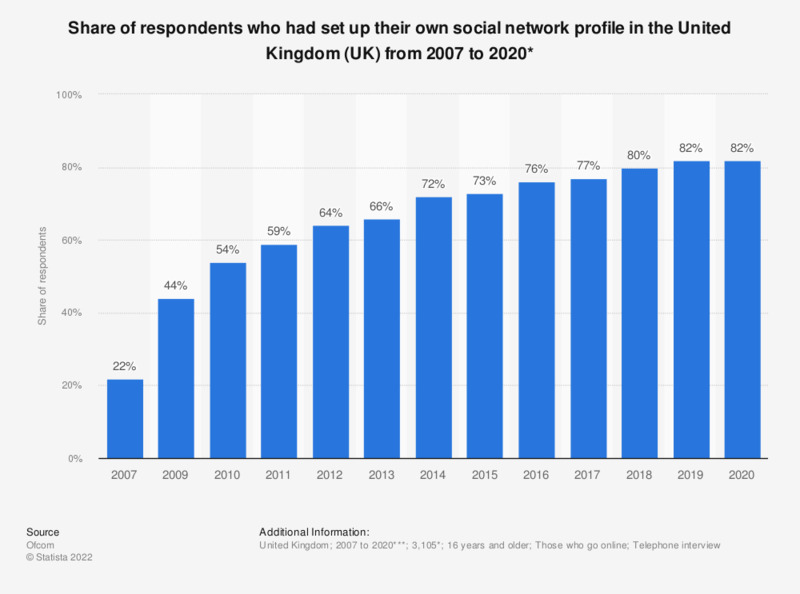 This statistic illustrates the findings of a survey on the internet users regarding creation of a social networking profile in the United Kingdom (UK) from 2007 to 2017. During the survey period in 2012, it was found that 64 percent of respondents who went online reported having set up their own social network profile. In 2016, 76 percent of responding individuals had their own profile. Over the period in consideration, the share increased from 22 percent in 2007 to 77 percent in 2016. As of November 2016, YouTube surpassed Facebook as the social network with the farthest reach in Great Britain. * The original survey question was: "I'd now like to ask you some questions about social media - so using websites or apps like Facebook, Twitter, Instagram, SnapChat and YouTube. Do you have a social media profile or account on any sites or apps? (SINGLE CODE)"
** The most recent survey was carried out November to December 2017. Data for years previous to 2013 published earlier by the source.